A Japanese idol singer’s success hinges on their ability to create a personal bond, or at least the feeling of one, between themselves and their fans. But even if you go to watch an idol unit perform live, you’re getting the same experience as every other fan in attendance, and listening to pre-recorded CDs feels even less unique. So for fans looking for a more personalized way to support and interact with their favorite idols, there’s a new service called pokeLIVE. pokeLIVE offers telephone conversations with idols, and to clarify, these aren’t pre-recorded voice messages, but live phone calls placed to the user’s smartphone or PC. While exact available times vary by individual idol, the service as a whole trumpets that it offers phone calls 24 hours a day, 365 days a year. ▼ Video for the summery “Bubbling Squash,” from Super Girls, another unit whose members offer phone calls through pokeLIVE. Each call is a brisk 30 seconds long, which should allow fans to squeeze one in regardless of how busy their lifestyles are. Once the time is up, the system automatically hangs up the phone. However, users are allowed to purchase as many conversation tickets as they like, which can be used for any idols on pokeLIVE’s roster. As long as an idol’s schedule, as posted on the pokeLIVE website, is clear, phone calls can be requested with as little as five minutes of lead time. 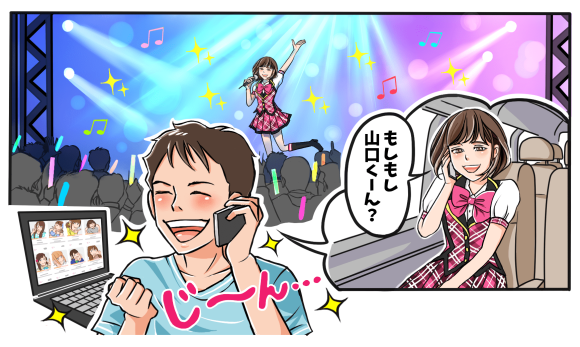 Registration for the service is free, but a fee of 2,900 yen a month gives users the ability to schedule calls between 8 p.m. and 5 a.m., as well as access to limited-time guest idols (like free users, premium members must purchase conversation tickets separately). While the calls are billed as coming directly from the idols’ personal phones, pokeLIVE’s intermediary system prevents either the idols’ or users numbers from displaying, providing privacy on both ends of the service. The system also operates as a toll-free number, meaning that you won’t rack up extra mobile phone charges during the conversation. PokeLIVE touts itself as being a way by which fans who don’t have the time/money to attend a group’s concerts can still support the idols. Since the service also works with microphone-equipped PCs, ostensibly it should be open to overseas users as well, and for those of you interested in the prospect of a little idol chatter, pokeLIVE’s registration page can be found here. Did they really have to make a video with an 'idol' group in bikinis? What other kind of CD is there? To each his own. But it kind of looks like japan’s male population is feeble. You want to know the reason for the declining birthdate? I’m point at you POKElive subscriber. How ill would you have to be to find this even remotely arousing? I’ve heard that these girls get fan mail - all in shaky handwriting and mostly unfinished. In America we have these sick 'beauty/talent' pageants for girls no older than 6. Then there's the 'Freedom Girls' - cheerleaders for Trump's rallies flipping around and chanting his personality cult praises. It's all a perverts' paradise city to me. And this is absolutely exploitative and disgusting. Chat for 30 seconds with a 'favorite' idol girl. They look quite too young to be seen in bikinis up this close - and to sell fruit drinks too. Man, this is absolutely sick and horrible. You might be talking to somebody else, other than your 'idol'. You know, in America with chat lines set up like this on websites - that's how the cops nail predators. A Japanese idol singer’s success hinges on their ability to create a personal bond, or at least the feeling of one, between themselves and their fans. Well, it certainly doesn't hinge on the music, being all repetitive and manufactured. God forbid that a singer relies on music talent for success. Imagine a world like that... Insanity! A bit wacky, but that's part of what makes Japan unique. At least it seems like a novel idea. OTOH, it smells of exploitation of both sides by shady agencies in an effort to make money under stagnant economic conditions. meijaToday 02:58 pm JSTA Japanese idol singer’s success hinges on their ability to create a personal bond, or at least the feeling of one, between themselves and their fans. Don't let the American 'music' industry bigwigs learn about this. They don't care for music either - just image. it makes you wonder where their parents are. 'Squeeze'? Mhm. Yeah, you just said the magic word. That's what this pathetic industry is all about. It sure ain't about the MUSIC!